Arsenal could reportedly try and sign Antonio Valencia this summer as the Man Utd veteran is set to leave Old Trafford when his contract expires. The 33-year-old has been with the Red Devils since 2009, making 338 appearances for the club while winning a whole host of major honours including two Premier League titles and the Europa League. 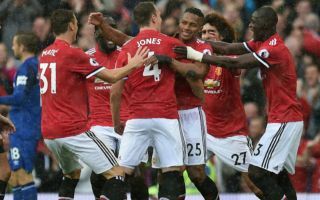 Valencia even switched his position to continue to establish himself as a key figure at right back, and he has undoubtedly played a big role for United over the years. However, with his current contract set to expire this summer and with injuries and competition for places limiting him to just eight appearances so far this season, it has even been suggested by interim boss Ole Gunnar Solskjaer that his time at Man Utd could be coming to an end, as seen in the video below. With that in mind, the Ecuadorian international may well have to start considering his future, and his agent and father has now revealed that one of the options on the table is a move to north London to join Arsenal. “He definitely will not continue in Manchester,” Luis Valencia told El Universo. “He wants a change in the air and the club is not going to renew him either. Like everything in life, everything comes to an end. “Arsenal, West Ham, Inter Milan and one club from China are options, but in football everything is changing. That’s a commendable approach to have at this stage of his career, and it’s understandable that Valencia wants the security and reassurance of a two-year deal to take him into the latter stages of his playing days. With Hector Bellerin’s injury woes in mind as well as Unai Emery’s struggles to fill the void so far this season, the Spanish tactician could certainly do with a reinforcement in that department this summer.
? – The end of the road for Antonio Valencia at @ManUtd?